OhGizmo! 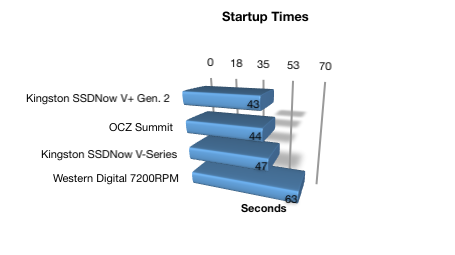 Review – Kingston SSDNow V+ Gen. 2 | OhGizmo! We’re no strangers to SSD’s here at OhGizmo, as we’ve already had the pleasure of reviewing a couple. 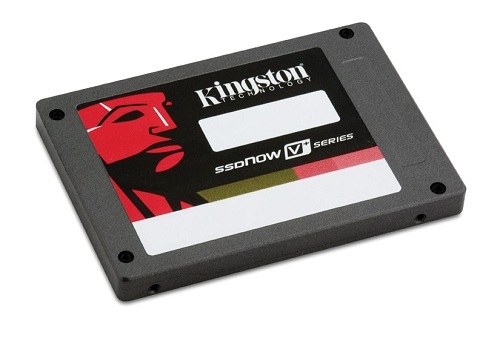 Today Kingston announced their second generation of SSDNow V+ drives. These are their higher-end enthusiast drives, very similar to the OCZ Summit drive that we reviewed a few months ago. 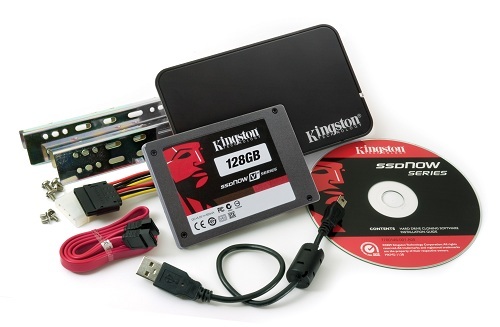 Kingston sent over one of these new SSD’s so that we could put it to the test. Just like the V Series drive that we reviewed back in August, the V+ is available in a bundle or as just a standalone drive. The bundle includes mounting brackets, a 4-pin power cable converter, SATA cable and USB enclosure (for your old drive) and drive cloning software. The bundle will only set you back around an extra $15, which is more than enough to justify the cost. Heck, the Acronis drive cloning software alone is worth it. 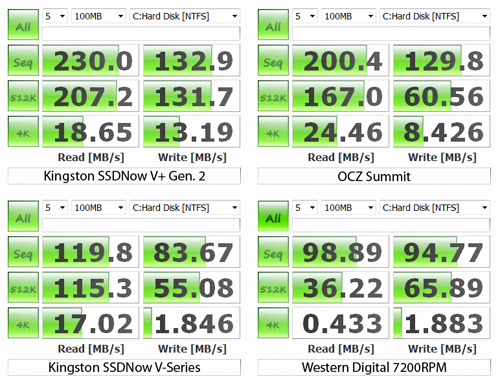 Those sequential read/write speeds are some of the more impressive that I’ve seen in this class of SSD. Of course we’ll have to see how it holds up in real-world testing. The new V+ drives also feature TRIM support, which should help it maintain these high speeds throughout its lifespan. We’re using the same test system as our previous SSD reviews. This keeps all of our old scores relevant. I was a little disappointed to see that the drive didn’t quite live up to the promised write speed that Kingston advertized, though it was spot-on with the read speeds. 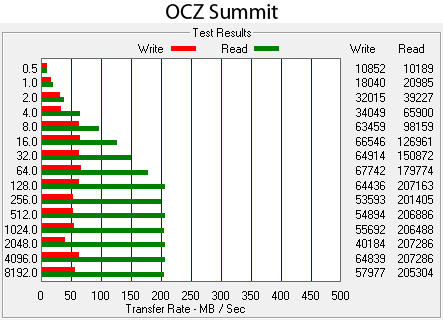 That said, it still knocked the pants off of the similarly-classed OCZ Summit in a few of the tests. Here we see scores a little closer to what Kingston has specified. 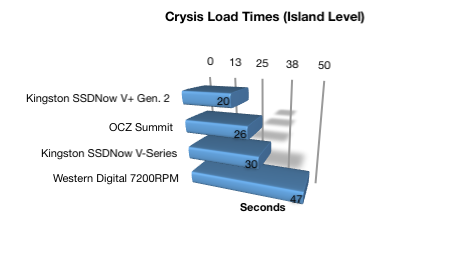 We also see it deliver a dominating lead in write speeds over the OCZ Summit. Of course synthetic tests only tell us so much. On to the good stuff! I honestly didn’t expect to shave another 6 seconds off of the load time here. While an SSD isn’t going to improve your frame rate, it will make sure that you get into the action as quick as possible. This is the test that is going to make any SSD shine, and shine the V+ Gen. 2 did. Those high write speeds got the transfer time down to just over a minute. That’s less that 1/3 of the time it took with a standard 7200RPM SATA hard drive. Unfortunately I think that we’ve hit the wall with Windows boot times. Most of the time here is actually spent waiting on the motherboard to do its thing. The amount of time spent loading Windows is relatively short, so I don’t expect to shave much more off of this, even with future drives. 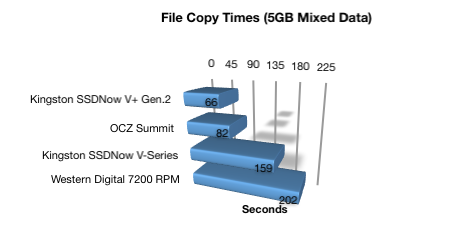 When compared apples-to-apples against the OCZ Summit, this drive clearly stands above. Not only do you get more value (thanks to the offered bundle) but you’re getting significantly higher speeds. The 128GB drive that we tested retails for $512, ($528 if you opt for the bundle) which definitely puts this into the enthusiast class. 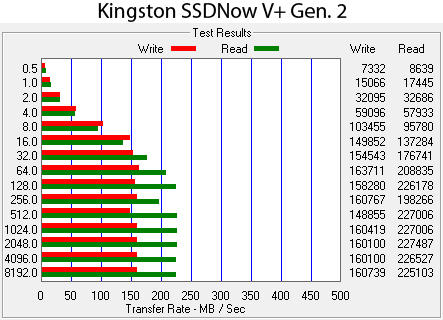 If you’re looking to spend that kind of money on a new SSD, I wouldn’t have to think twice about recommending the Kingston SSDNow V+ Gen. 2. You can also find it in 64GB, 256GB and 512GB flavors. $15 for everything? That's 100% worth it.